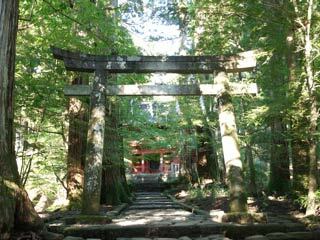 Takio Shrine (瀧尾神社) is one of Shrines in Nikko. It is a secondary shrine of Futaarasan Shrine and one of three gongen shrine. It was built in 820 by priest Kukai. Legend said, he saw the goddess at this place. This phenomenon is call Yoko(影光). Before Toshogu Shrine was built, this shrine was the center of Nikko worship. The famous Yamabushi practice "Gohanshiki" which Yamabushi eat huge bowl of rice, was also born in here. was built in 1696 by Kaji Sadayoshi who is one of Samurai of the third Tokugawa Shogun Iemitsu. People used tested their luck by throwing rocks at the hole of the gate. Under these trees, Pries Kukai saw the goddess. Therefore, this place considered as the sacred place in this shrine. In 18th century, first 3 cedar trees has been fallen. Today, it has 2nd generation trees and first ones are still lay down. ... for having baby and safe delivery. ... is the one of three sacred water in Nikko. Priest Kukai served god with this water. Legend said, this water makes Sake taste better, therefore, today, many brewery still visit this pond.